When his feet hit the springboard for the final time on the last three-meter dive of his college career, a front two-and-a-half with a twist, Logan Pearsall thought he was in trouble. “I was just trying to think of what my coach had said: to have a good hurdle, a good takeoff, get my head up, things like that. I started walking on the board, and when I did my hurdle I stepped back, like, four inches from the end of the board. The first thing that went through my mind was, ‘oh, crap,’ because I was so far back on the end of the board,” the Port Allegany grad and Clarion senior recalled. “Luckily, during practice I’ll do three of six dives from that far back, so I was used to doing it from there. So I just threw really hard for the dive; when I hit the water, it felt like a really good entry, but I wasn’t sure because I was so far back. So when I hit the water, I was pretty unsure of myself. Good enough to win a fourth national championship with 565.15 points, outclassing his nearest competitor by a double-digit margin and obliterating his own NCAA record along the way at the recent 2011 Division II nationals in San Antonio, Texas. With six returning PIAA placewinners in the 16-man Class AA 130-pound weight class at last weekend’s state championships – four in Chet Tanner’s half of the bracket – the Port Allegany senior knew he’d be in for a battle just to make it to the podium. The five Allegheny Mountain League wrestlers making the trip to the Giant Center in Hershey were reminded of that in Thursday morning’s preliminaries, with only Bradford senior Mark Havers, wrestling in the AAA 152-pound weight class, avoiding the consolation bracket with a first-round win. So, after dropping a 7-0 decision to Montoursville’s David Batkowski, Tanner knew the stakes when he walked onto Mat 2 against Drew Jackson, the Southeast Region’s No. 4 seed, that afternoon. Good morning from the Giant Center, where Brockway’s Joel Yahner, the lone District 9 Class AA wrestler still alive in the championship bracket, advanced with a 3-0 win over Corey Garry (Fort Cherry). He’ll face defending 285-pound champ John Rizzo (Richland) in this evening’s semifinals, slated to begin at 6:30 p.m.
On to the second round of consis, where Chet Tanner’s next opponent is Arty Walsh (34-6) from Schuylkill Valley in District 3, who lost an 11-2 decision to Coltin Fought in this morning’s quarterfinal round. Walsh will be a tough out: he won the 112-pound state championship in 2009 as a freshman at Wyomissing before transferring first to Juniata, then to his current school. Corey Bush (Ridgway), the 119-pound D-9 champ, is on Mat 2 right now. Choosing the up position to begin the second period, he put Claysburg-Kimmel’s James Dodson on his back for a moment, and leads 2-0 after two. More back points in the third, and Bush has this one well under control, moving on to the third round with an 8-1 win. At 125, Jesse Wolfe (Johnsonburg) takes his match against Jaydon Rice to OT, but the Bethlehem Catholic wrestler gets the takedown and the 6-2 win. UPDATE: Tough out indeed. Walsh is lightning-quick. Already up 4-1 at the beginning of the second period, he turns one of Tanner’s shots into a takedown and near-fall of his own. 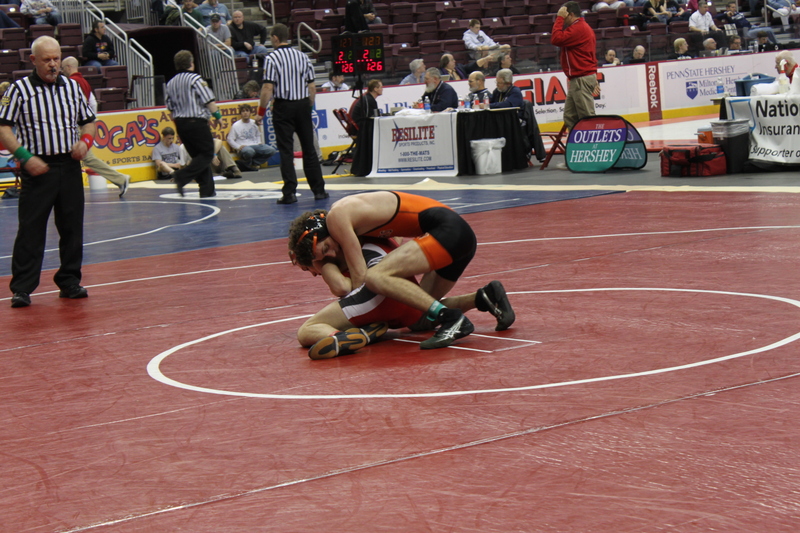 Twelve seconds into the third, it’s over, as a reversal gives the Schuylkill Valley wrestler an 18-3 TF. Tanner ends his senior year with a 39-6 record, and it’s time to make the long drive north. There’s some good wrestling in District 9, but once you get to the state championships in Hershey, it’s a whole different ballgame. Thursday morning’s Class AA preliminaries proved that, as Big 30-area matmen went 0-5 in their opening-round matches. They’ll wrestle in the first consolation round early this afternoon, with Class AAA — and Bradford’s Mark Havers, the only area wrestler still alive for a state title — following them onto the mat at 4 p.m.
For brackets updated at the end of each match, visit the PIAA website. UPDATE: The locals fared better in the afternoon, with three out of five winning their first-round consi matches. Port’s Chet Tanner scored a takedown in the final second of the first period, added another in the third, then held on to post a 4-1 win over Drew Jackson (Pequea Valley, 37-14). Elk County entrants Bush and Wolfe are also still alive, with just the two Smethport wrestlers going two-and-out. Second-round consis start tomorrow morning at 9:45. See you then. By the time the Port Allegany senior walked off the mat in Sharon with a 15-0 technical fall over Taylor Ellis (Conneaut Lake) in the 130-pound semifinals, he knew he could go ahead and book another business trip. Tanner (38-4) couldn’t solve two-time state placewinner Dylan D’Urso (42-5) in the championship match, as the Reynolds junior captured his third straight Northwest crown with a 12-0 major decision. However, Tanner’s second-place finish made him one of just five Big 30-area wrestlers in Class AA to earn a trip to Hershey for this weekend’s PIAA Championships, with Smethport lightweights Trent Neely (2nd-103) and Nate Schwab (2nd-112), Ridgway’s Corey Bush (3rd-119), and Johnsonburg’s Jesse Wolfe (3rd-125) also advancing by virtue of their top-three standing. Seth Lowery, seen here bulling his way toward the end zone in Port Allegany's 47-40, four-OT playoff win over ECC, has been added to the Pennsylvania roster for the Don Raabe Big 30 Charities Classic. Kickoff for the 38th annual all-star game between teams from N.Y. and Pa. is slated for Aug. 6 in Bradford. Seth Lowery ran roughshod over opposing Allegheny Mountain League football teams last fall, helping to lead Port Allegany’s deepest foray into the District IX playoffs in school history and earning a berth on the Olean Times Herald Big 30 All-Star Team. Already a prestigious honor, a spot on the Big 30 squad is even more significant for senior players because it comes with an automatic invitation to participate in the next Don Raabe Charities Classic. This week, the Raabe committee made it official with the announcement that the 5-7, 190-pound Gator running back/linebacker, a finalist for both the Big 30 Player of the Year and Defensive Player of the Year awards in 2010, has been added to the Pennsylvania roster for this year’s game. The 38th annual Big 30 Don Raabe Charities Classic will be played Saturday, Aug. 6, 2011 at Parkway Field in Bradford, Pa. The first 37 games have produced nearly $1.5 million dollars to benefit numerous charities and personal causes throughout the Twin Tiers. Teams consist of graduated seniors from 30 high schools in Pennsylvania and New York. The Pennsy roster includes players from Bradford, Cameron County, Coudersport, Eisenhower, Elk County Catholic, Kane, Johnsonburg, Otto-Eldred, Port Allegany, Ridgway, Sheffield, Smethport, St. Marys, Warren and Youngsville. There’s a change north of the state line this year, when players from the Chautauqua County schools of Southwestern and Frewsburg will join those from traditional Big 30 members Allegany-Limestone, Bolivar-Richburg, Cattaraugus-Little Valley, Cuba-Rushford, Ellicottville, Franklinville, Gowanda, Olean, Pioneer, Portville, Randolph, Salamanca and Wellsville. New York won last year’s contest 46-37, increasing its series lead to 19-16-2. Lowery, a three-time AML All-Star who lists the Buffalo Bills as his favorite team and Green Bay Packers linebacker Clay Matthews as his favorite player, gained 1,011 yards and scored 10 touchdowns on 171 carries in 2010 to lead the Gators in rushing for the third consecutive season. 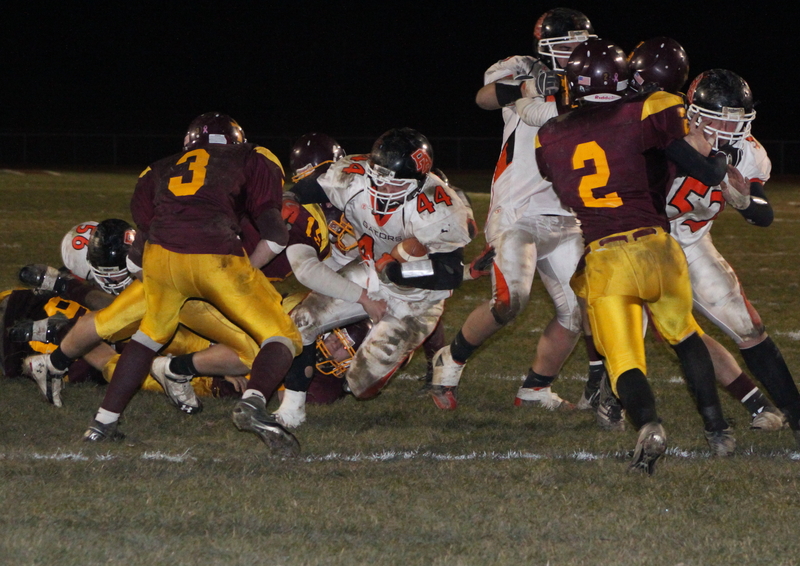 He saved some of his best work for the Gators’ playoff run, with a 154-yard, four-touchdown performance – including the game-winning score – in Port’s wild 47-40, four-overtime quarterfinal victory at Elk County Catholic. A National Honor Society student and a multi-sport athlete who qualified for districts in the shot put last spring, Lowery plans to attend Slippery Rock to major in physical education. At Saturday night’s District IX Wrestling Championships in Clarion, Port Allegany’s Alex Gular was leading 2-1 in the 152-pound title match when suddenly, he appeared to be distracted by something. As Gular turned his head, his opponent, Redbank Valley’s Cole Shirey, sensed an opportunity and attacked.